Calor safely and efficiently delivers your desired water temperature with and promotes a mindful water use with a temperature sensor and modern technology. It’s a result of re-imaging and streamlining the entire flow of shower experience and therefore leads to a new and more efficient lifestyle. It’s smart to let you set your water temperature, suggest when to get out of shower with reward and gradually guide you to the shower time recommended by Environmental Protection Agency(EPA). Generally people shower everyday, and yet the shower experience stays relatively similar since the first day a faucet fixture was invented. It in fact poses issues such as unpredictable adjustment of water temperature, encountering scalding, overusing and wasting water. With Calor, you have a whole new shower experience that is more effortless, safe and eco-friendly. 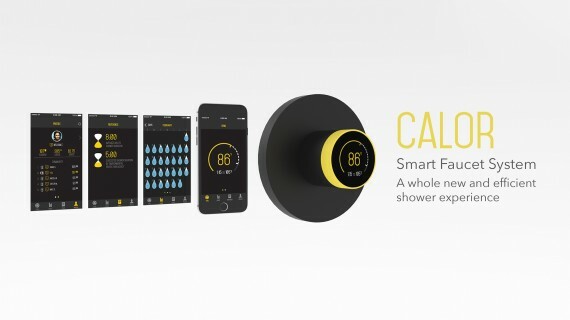 The App connects with Calor to expand the function and service of a typical shower fixture even before and after the shower. – Sync: It notifies you when the shower it’s ready for a more flexible and efficient schedule. – Usage: It generates an update-to-date water usage as a report, so you know how much water you use and spot any high usage or progress in reducing water use before you get your water bill. – Stats: It compiles useful references of water temperature and shower time suggested by EPA to point you to scalding-free and water-saving lifestyle. -Profile: It keeps you motivated with your achievement of badges/buckets earned, water and money saved and your ranking in your social circle. Calor enables a new way of thinking about and interacting with a shower faucet. People with efficient life style could save time and effort in shower. A family who has children or elderly people would no longer need to worry about scalding. Families, landlords or even business like hotels can save money in saving water. Government could better manage and deal with water shortage as people are becoming more mindful of water use. With the iterative ideations and prototypes in forms, interface, interaction and service, Calor is able to transform a typical shower experience into one that is more predictable, safe, effortless and eco-friendly.